Alaska Lieutenant Governor Mead Treadwell will be visiting the ICP this afternoon and available at the 1:30pm Media briefing. Fire crews took advantage of the cool and damp conditions as they continued to “mop-up” (extinguish all burning material) up to 300’ from the firelines. Fuels dried considerably on Friday with Chinook winds affecting the Eastern edge of the fire area. Isolated pockets on the east side of the fire displayed very active backing despite 40mph easterly winds and limited precipitation. Crews have tied in the line to Star Lake and are now mopping up the area near Kasilof. Fire containment is now 54 percent, with 751 firefighters working to keep the fire away from populated areas. 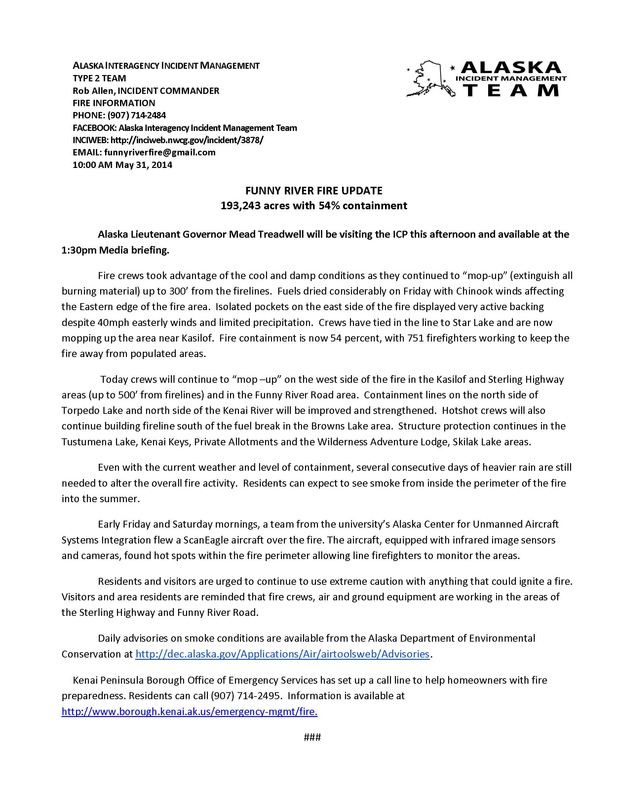 Today crews will continue to “mop –up” on the west side of the fire in the Kasilof and Sterling Highway areas (up to 500’ from firelines) and in the Funny River Road area. Containment lines on the north side of Torpedo Lake and north side of the Kenai River will be improved and strengthened. Hotshot crews will also continue building fireline south of the fuel break in the Browns Lake area. 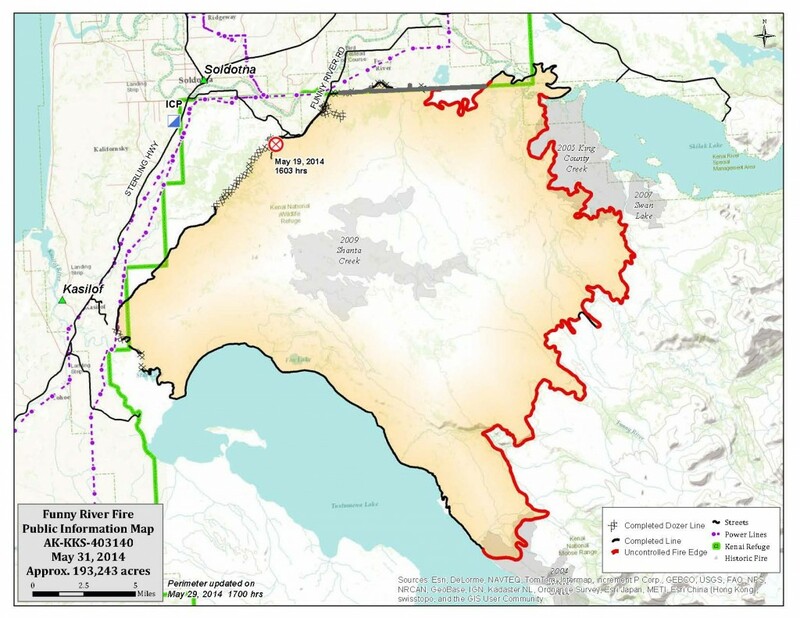 Structure protection continues in the Tustumena Lake, Kenai Keys, Private Allotments and the Wilderness Adventure Lodge, Skilak Lake areas. Even with the current weather and level of containment, several consecutive days of heavier rain are still needed to alter the overall fire activity. Residents can expect to see smoke from inside the perimeter of the fire into the summer. Early Friday and Saturday mornings, a team from the university’s Alaska Center for Unmanned Aircraft Systems Integration flew a ScanEagle aircraft over the fire. The aircraft, equipped with infrared image sensors and cameras, found hot spots within the fire perimeter allowing line firefighters to monitor the areas. Residents and visitors are urged to continue to use extreme caution with anything that could ignite a fire. Visitors and area residents are reminded that fire crews, air and ground equipment are working in the areas of the Sterling Highway and Funny River Road. Daily advisories on smoke conditions are available from the Alaska Department of Environmental Conservation at http://dec.alaska.gov/Applications/Air/airtoolsweb/Advisories. 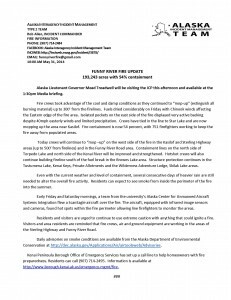 Kenai Peninsula Borough Office of Emergency Services has set up a call line to help homeowners with fire preparedness. Residents can call (907) 714-2495. Information is available at http://www.borough.kenai.ak.us/emergency-mgmt/fire. This entry was posted on May 31, 2014 at 3:15 pm. You can follow any responses to this entry through the RSS 2.0 feed. You can skip to the end and leave a response. Pinging is currently not allowed.